If you need any templates for your projects, please check out our templates page. Roberts Printing has mailing experts that will guide you in all your mailing campaigns. Roberts Printing puts some of the most advanced mail service technology to work for you. Our mailing professionals successfully provide a comprehensive range of services from personalized direct mail, labeling, mail sorting and delivery of unique customization of mail pieces using variable data technology. Our experienced staff will work with you from the beginning conception of your project to help ensure your finished product will meet all the necessary United States Postal Service guidelines and avoid unwanted surprises when it’s time to mail. We help determine correct weight, caliper, uniformity, flexibility, aspect ratio, and more. We also ensure your address block is placed properly, readable by USPS machinery and all guidelines are met. As an added layer of insurance, we can also run your data through the National Change of Address service (NCOA), per USPS rules. We understand these complexities and stand ready to help you through the process. Take advantage of the combined expertise at Roberts Printing to be rest assured that your project will be handled by professionals you can count on to deliver success! 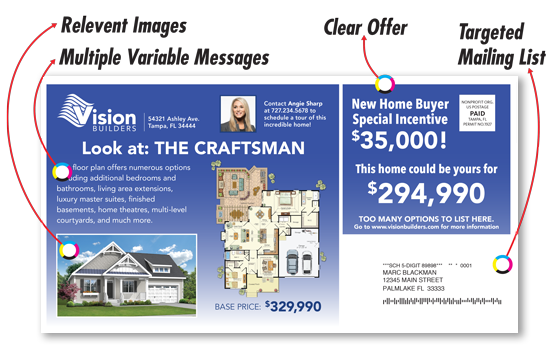 Looking to start a direct mail campaign? Successful direct mail campaigns require industry specific experience and knowledge. Our direct mail account managers are here to help you reach your goals. We strive to create campaigns that will bring you results, sell your products, and give you the best return on investment (ROI). To learn more, please call 727-442-4011 to schedule a consultation. How do I prepare my mail list? Setting up your mail list correctly for your campaign is a critical step.